All live in the ocean, on the sea floor. Many starfish live in deep water, others in shallow water. Some live in the intertidal zone, between low and high tide. They have five or more arms and can be quite large. The Sunflower sea star (Pycnopodia helianthoides) is the largest: fully grown, its arm-span is about a metre. This is a bit larger than the famous Crown-of-thorns starfish, which lives on coral polyps. Although starfish are invertebrates, they do have a kind of skeleton. The bodies of starfish are composed of calcium carbonate plates, known as 'ossicles'. These form the endoskeleton, which takes on a variety of forms such as spines and granules. They have a primitive nervous system, but not a brain. They also do not have blood, instead they use sea water to pump things around their bodies. There are over 1500 different species of sea star. Most sea stars are predators. They eat mussels, clams, and other bivalves. Occasionally, they catch small fish. 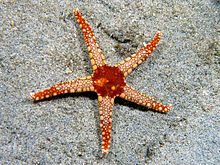 Most starfish have five arms, called rays that come out from a center circle (disk). If a starfish has more than five rays, it will often have rays in multiples of five; there could be 10, 15, 20, or even 30 rays on one starfish. This is called pentameral (five-fold) symmetry. "A heavily calcified sturdy skeleton capable of resisting both large and small predators has evolved in many tropical sea stars... a very firm body wall... still permits a degree of flexibility of the body and arms". The movement of starfish is guided by their senses of touch and sight. There are five 'eyes', light-sensitive cushions, one at the end of each arm. These and the tube feet are connected to nerve fibres, so these animals are more complex than might appear. Although starfish started off as filter-feeders, they evolved to become major predators of shell-fish (the brachiopods and bivalves). They can also eat small crustacea and fish. Their tube feet developed suckers, perhaps originally to improve movement. Later, they were used to open shell-fish. "Suckered tube feet may not have been present in any Palaeozoic sea star". The shells of brachiopods and bivalves are held together by strong muscles. What the starfish does is clamp hold of them on either side with its tube feet, and apply a steady pull. The starfish, with its muscles and hydraulic system, can pull for much longer than any bivalve muscle can withstand. Apparently, ten minutes are usually enough to open the shell a bit. Then the starfish slips its stomach inside the shell. The stomach can get through a slot as narrow as 0.1mm. The starfish then dissolves the mollusc where it lives, absorbing the nutrients. This digestion process takes much longer than opening the shell, perhaps a couple of days. The ability of starfish to eat brachipods and bivalves developed in the Mesozoic, especially in the Jurassic and Cretaceous. This was part of the Mesozoic marine revolution, which transformed the sea-floor fauna. Weakly defended and static shellfish disappeared, and more heavily armoured or more mobile shellfish flourished. Because starfish like to eat clams and oysters, fishermen who gather shellfish have tried for years to get rid of them. To kill the starfish, fishermen would catch them, slice them right in half, and throw them back in the ocean. However, because starfish can grow back parts of their bodies, they were actually increasing the number of starfish. ↑ Sweet, Elizabeth (22 November 2005). "Fossil Groups: Modern forms: Asteroids: Extant Orders of the Asteroidea". University of Bristol. Retrieved 2016-05-31. ↑ Knott, Emily (7 October 2004). "Asteroidea. Sea stars and starfishes". Tree of Life web project. Retrieved 2013-05-10. ↑ 3.0 3.1 3.2 3.3 Nichols, David (1969). Echinoderms. Ebury Press. ISBN 978-0-09-065994-4. ↑ At low tide they would be in rock pools. ↑ Sweet, Elizabeth (2005-11-22). "Asterozoa: Fossil groups: SciComms 05-06: Earth Sciences". Retrieved 2008-05-07. ↑ Blake D.B. 1984. Constructional morphology and life habits of the Jurassic sea star Sphaeroaster Quenstadt. Neues Jb. Geol. Palãont. Abb. 169, 74–101. ↑ Blake D.B. 1981. The new Jurassic sea star Eokainaster and comments on life habit and the origins of modern Asteroidea. J. Paleont. 55, 33–46. ↑ Jangoux M. and Lawrence J.M. (eds) 1982. Echinoderm nutrition. Balkema, Rotterdam. ↑ Nicholson F.C. How a sea star gets its clam. HighlightsKids. <http://www.highlightskids.com/Science/Stories/SS0596_howseastargetsclam.asp>. ↑ Vermeij G.J. (1977). "The Mesozoic marine revolution; evidence from snails, predators and grazers". Paleobiology 3: 245–258. https://www.jstor.org/pss/2400374. Retrieved 2008-05-13. ↑ Stanley, S.M. (2008). "Predation defeats competition on the seafloor". Paleobiology 34: 1–21. doi:10.1666/07026.1. ↑ Stanley SM (1974). "What has happened to the articulate brachiopods?". GSA Abstracts with Programs: 966–967. Wikispecies has information on: Asteroidea. Wikimedia Commons has media related to Asteroidea. This page was last changed on 7 February 2019, at 00:41.